How do I design an active recreation parklet? platform as well as the minimum equipment clearances. 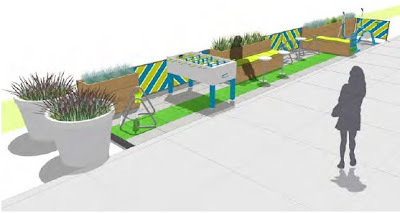 The proposed Spring Street parklet uses stationary bicycles. away from the machine to allow for proper clearances. appropriate clearances into the site design. To understand a city’s character, look no further than its parklets (which, as you know by now, are those mini–urban parks that replace parking spots with public amenities). San Francisco will never say no to a potential hack—witness Rebar’s awesome but ill-fated parklet made from a sliced Citroën cycling van—and Los Angeles will turn just about anything into a workout. With the opening last week of two new parklets on Spring Street in downtown L.A., passersby who regret downing that entire venti mochaccino can hop on one of the parklets’ two exercise bikes and people-watch while squeezing in a few minutes of cardio. Their bored companions can try a hand at the foosball table or just text from one of the nifty swing-style seats. Sure beats idling in a car! Read more. The new parklets are an initiative of the Downtown Los Angeles Neighborhood Council Complete Streets Working Group, which collaborated with city council, city planners, the local business improvement district, and AHBE Landscape Architects to transform two parking spots into a mini-playground for pedestrians. With some pro-bono help from Hensel Phelps, these urban patios warm up the streetscape with wood deck tiles, modular pavers, perforated-steel guardrails, and custom wood planters. 2005 with funding from the Kaiser Permanente Foundation. equipment machines and are located within public parks. works with a community partner to select a park location. Parks Department that is responsible for their maintenance. insurance for the fitness zones. Each fitness zone costs approximately $45,000. users of the fitness zone but also in other parts of the park. equipment encourages others to be more physically active.